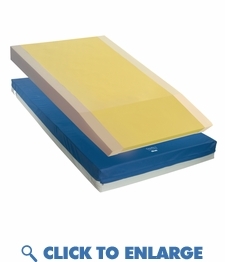 This pressure reduction hospital mattress offers the ultimate in multi layered foam. Designed for superior heel protection this mattress slopes from 6" to 4" in the lower foot section of the mattress. This ultimate pressure mattress uses four special layers of pressure reducing foam with the top layer laminated in true memory foam. The 450LB weight capacity provides the patient with optimal foam pressure redistribution. Ideal for home care, fits over standard medical bed frame or twin sized box spring. This pressure reduction hospital mattress offers the ultimate in multi layered foam. Designed for superior heel protection this mattress slopes from 6" to 4" in the lower foot section of the mattress. This ultimate pressure mattress uses four special layers of pressure reducing foam with the top layer laminated in true memory foam. The 450LB weight capacity provides the patient with optimal foam pressure redistribution. Ideal for home care, fits over standard medical bed frame or twin sized box spring. Mattress includes a 6� to 4� heel slope and a �channel cut� center layer of foam under the foot section to target heel ulcer prevention. Top layer is full-length open-cell visco-elastic memory foam. Bottom layer provides full length horizontally scored articulation cuts extending the durability and life of the mattress significantly. Cover is fire retardant, fluid proof, tear resistant, low sheer, and easy to clean. 1 Year Warranty on the cover. 15 Year Limited Warranty.